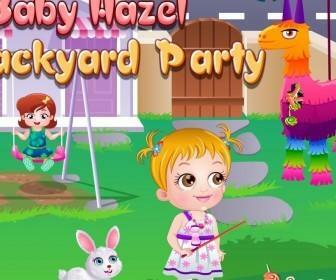 The Baby Hazel Backyard Party Game shows Baby Hazel getting inspired for an afternoon party, getting dressed for the party, preparing for the amusements and food at the party, and partying with her friends Bela, Liam, and Jake. Playing the game is fairly simple. A hand indicates what each character wants and moving the mouse to that item and back to the character brings the item to the character. Bad news if you are not fast enough because the children start crying. Crying is relieved by petting the children. This game involves satisfying the needs of multiple characters and moving a lot of objects around in a fairly complex environment. 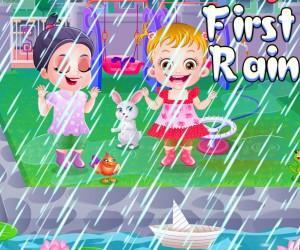 Some young children may find the game frustrating at first but if the child fails on the first try they can repeat the screen. Scoring is counted as happiness and as a number of points. 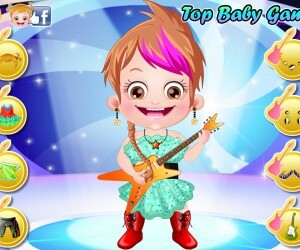 The faster you complete the tasks and satisfy the children in the game the more points you rack up. Mistakes result in crying and pouting children that have to be consoled and result in loss of points and happiness. 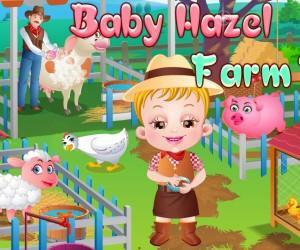 In the living room Baby Hazel is eating, feeding her pet rabbit and gets inspired to have an afternoon party by a song on the television. She calls her friend Bela and plans a party. Bela volunteers to ask the boys to come to the party. She gets dressed and proceeds to the backyard. In the backyard she prepares food, a swimming pool with a slide, a pinata, balloons, cookies, colored water, cookie dough and has a snack. Bela arrives at the back gate. The girls eat a snack. Then the boys arrive. The party really cranks up in the third scene with swimming, a colored cookie toss, and food. A clown arrives with fireworks. The girls try the pinata with a small stick without success but borrow a ball bat from the clown and break the pinata. Things wind down and the children leave for home. Children and adults might notice that even though the girls swim and shower they never look like they get wet. The boys are hardly active at all but this is a girl’s game. There are no adults in the game. 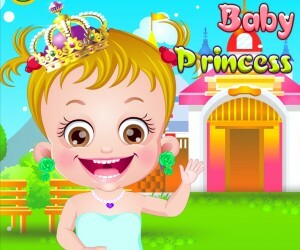 This is a fast and fun game that can teach your child some computer skills especially double clicking. The game is designed to produce good eye hand coordination. This game also helps teach children what really goes into an afternoon party and hopefully produces an appreciation of their parent’s efforts and love. The game includes the right mix of treats and nutritious food so your child leans how to eat well.